Diaspora: Two of the largest Indian diasporas exist on the continent in Durban and Nairobi. This has led to great familiarity with Indian culture in South Africa and Kenya. These two countries possess significant resources in minerals wealth and intellectual capital. This relationship between African and Indian businesses and politics thus has a long history in two of the most significant business hubs on the continent. Thus compares to the views of white westerners as colonialists/imperialists and of the Chinese as the new imperialists. Indian values and culture already have a base of diffusion on the continent, which will spread naturally, a significant advantage over China. 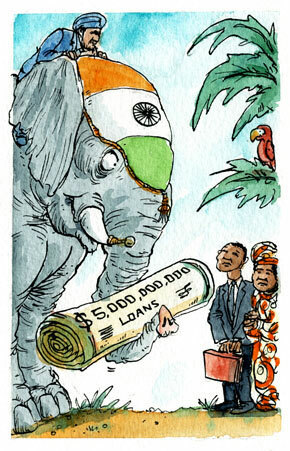 This contrasts with some of news stories that show that India is trying to match China with developmental resource-backed loans. However, the ability to relate to one another culturally will be more important in the long term success of engagement with the continent than how big of a loan you can offer. Sanctions are a hard form of economic power that Joseph Nye discusses in chapter three of his new book, The Future of Power, and a topic that is discussed widely today in relation to Syria. 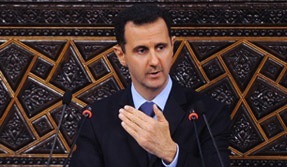 Many policy makers are pondering whether sanctions will be useful in convincing President al-Assad to stop killing his people. No doubt some in the camp that support sanctions would point to the smart sanctions that Rose Gottemoeller discusses in her article, The Evolution of Sanctions. She claims this progress has taken place after the world noted the failure of the blanket use of the measure against the Iraq regime that lead to suffering by the target population as a whole, and the corruption it bred. Gottemoeller suggests that smart sanctions “have been honed through the ‘war on terror’, and sanctions are hitting their targets among corrupt elites more often” (109). Many argue that sanctions are better than doing nothing, and a step below military engagement. This enables countries with public opinions that do not support the sacrifice of blood and treasure to still make their preference known in a forceful way. However, despite the near constant stream of sanctions and their intellectually enhanced offspring in the past decade, where do we see successes? Nye explains where economic power can be seen in the world today, but doesn’t place it fully into a country’s diplomatic toolkit. For example, many of the United States’ links with China are symbiotic and the circular relationship requires both sides to make policy changes in order to move forward. Certainly sanctions, as a piece of the arsenal of power could not solve this problem. Thus sanctions as a mode of influence have a fairly limited scope of use, even the ‘smart’ kind. Today, one of the most incredulous remarks by an ANC spokeswomen sparked my interest to such an extent that I felt the need to share it. 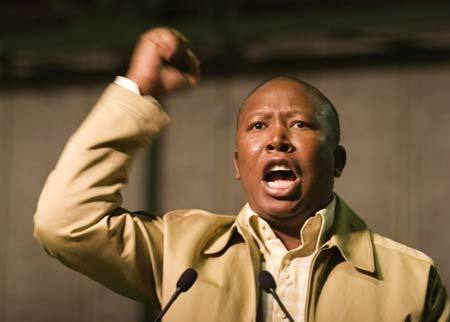 The remark was from a story about a ban being placed on Julius Malema’s ‘Shoot the Boer’ liberation song. For anyone who has followed South African politics recently, they have undoubtedly come across stories describing Malema’s use of the song to fire up his supporters, often appealing to them using populist and racist speech. Malema of course defends all of this by saying that he is simply using a song from the time of liberation (despite the fact that he was only 9 years old when Apartheid began to fall), and that he does not intend to spark race based violence. Malema is in deeper trouble these days, with his membership in the ANC under review, yet the ANC still felt the need to contradict this ruling.